Obituary for Hazel M. Hunter | Goldsboro-Fabry Funeral Home, Inc.
Hazel (Johnson) Hunter of Fairchance,Pa., age 96, went home to be with the Lord on Wednesday, February 7, 2018. She was preceded in death by her husband, Harry D. Hunter. She is survived by her children: Kim, Kathy, and Craig (Linda); grandchildren: Dorinda (Jeff), Jay (Jacquie), Kelly David), Letha (Steve), Greg (Lori), Chris, Evan, and Alan (Linda); six great grandchildren; two great great grandchildren. Fairchance First Presbyterian. She was a member of the Women’s Association, the choir, and participated in many church fundraisers. She also served as a church Deacon. Church St., Fairchance, PA. Funeral Service at 1:30 p.m. Interment to follow at Addison Cemetery, Addison, PA. 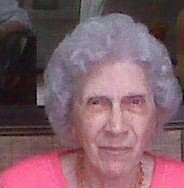 Flowers may be sent to GOLDSBORO-FABRY FUNERA L H O M E, 21 East Church Street, Fairchance,PA 15436.